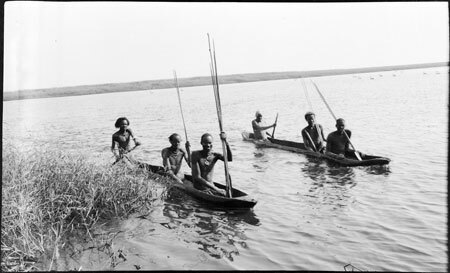 Two Nuer dug-out canoes on a river, with three men in each, one paddling and two passengers. Meek noted that he crossed the river in one of these canoes sometime in December (year unknown), but that some time later it was practically dry. Morton, Chris. "Nuer dug-out canoes" Southern Sudan Project (in development). 03 Jan. 2006. Pitt Rivers Museum. <http://southernsudan.prm.ox.ac.uk/details/1998.204.5.64/>.